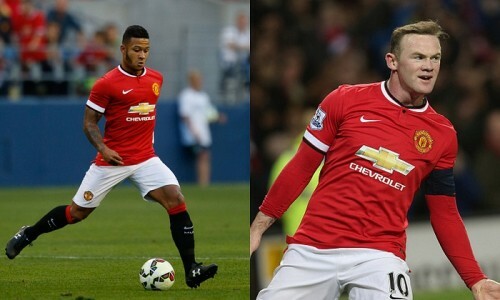 Manchester United Moneyball - How good is the Red Devils' attack? How good is Manchester United’s attack compared to their Top 4 rivals? In an ongoing series, we continue to use the ‘Moneyball’ approach to player analysis – this time to look at how the Reds’ forward line measures up to Chelsea, Manchester City and Arsenal. Only forwards who made at least 25 appearances last season have been considered and their statistics have been compiled into each club’s ‘representative’ forward. We tighten the measurement by limiting our analysis to three forwards given that Van Gaal will likely use a 4-3-3 this season. The data places Rooney and Juan Mata as two of the front three, with new recruit Memphis Depay leapfrogging Ashley Young to take up the left-wing berth. Assuming that Depay performs at least as well as he did in the Erevidise, United’s numbers look a lot better. In Table 2, above, this theoretical front three pulls its weight in terms of contribution to total team goals. The likely absence of Marouane Fellaini means that United’s midfield will be more measured and cultured, with less inclination to ‘verticality’. However, Depay, Rooney and Mata will have to make up for that lack of attacking thrust from deep. Even in this formation the Reds lag behind Chelsea, City and Arsenal in the number of dribbles per appearance. Data Rant’s earlier look at Danny Welbeck revealed a strong relationship between goals and take on attempts. This suggests that Depay’s ability to go past players may increase United’s goal output even further. There has been much talk of signing a world-class forward this summer, but it makes little footballing sense to deploy Rooney in midfield in the coming season – assuming a 4-3-3 – with the club having acquired Bastian Schweinsteiger and Morgan Schneiderlin. And while Van Gaal has never been afraid to drop a star from his team, any omission of the United captain must be predicated by the recruitment of a striker who is clearly better than the former Everton player. Rooney could not, for example, complain about losing his place to Lionel Messi! Surprisingly, perhaps, this analysis finds no striker who meets the above criteria. Lyon’s Alexandre Lacazette is better than Rooney on every criteria but falls well short of attempting 225 per cent more take-ons than Rooney. This makes sense. Rooney’s 1.2 runs-per-appearance is good for a striker who rarely has space to run at defenders. Meanwhile, promising forwards such as Harry Kane may be worth a look, but the data shows there is not obviously a striker who will be an upgrade on Rooney. Recent speculation surrounding Thomas Muller supports the theory that Van Gaal is seeking a better false winger. Gareth Bale is an expensive option, but one that will improve United’s forward line by adding much-needed thrust to the front three – to the point that United’s attack would be comparable to rivals’. Data Rant’s search of wingers in England, Spain, Germany, Italy and France has revealed Hoffenheim’s Kevin Volland as a cheaper potential transfer target to bridge the gap between United and Chelsea. In pure numbers, Volland is better than Mata in every way. Depending on how highly Van Gaal values James Wilson, United may also add a promising young striker to the squad. A bonafide superstar, however, makes little sense if 4-3-3 continues to be Van Gaal’s preferred system. At present, a right-winger will improve the Reds’ attack more than a striker.